A Church Reborn: Teens restore a beacon of faith for an ailing community. A dog appeared as though from nowhere. A robust, yellow mutt with amber eyes, he followed me around the old church I was photographing, stopping only to quench his thirst from the courtyard fountain. Hot in the New Mexico sun, he wagged his tail as water dripped from his jowls. As I petted him, I noticed a car backing out of a nearby garage. I tucked my camera away and hurried up the driveway. My mutt buddy followed. “Is this the official church dog?” I asked. The man was Miguel Macaya. Locals know him as Father Mike, pastor of Our Lady of Purification Church in Doña Ana, N.M. The National Trust for Historic Preservation lists New Mexico’s earthen churches among the 11 most endangered places in the United States. Until recently Our Lady of Purification, or Nuestra Señora de la Candelaria, was no exception. 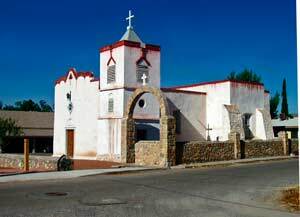 Constructed in the mid-1800s, the vernacular adobe church rests at the heart of Doña Ana village, a largely impoverished farming community near the Mexican border. Doña Ana itself started as a simple campsite along the commercial road connecting Mexico City and Santa Fe. Founded in 1842, Doña Ana bears the name of the pioneer woman and landowner who settled and probably died there in the late 1600s. Little is known about her, though local legends run the gamut of possibilities, describing both her kindness to strangers and her cruelty toward her workers. Our Lady of Purification Church became the first permanent building constructed on the site, preceded only by the “ditch project,” which transferred much-needed water from the Rio Grande into the arid, inhospitable valley. Like the peaks and valleys of the region, the village’s long history has highs and lows. It was a thriving oasis and symbol of true ethnic and cultural diversity one decade, but in the next was plagued by war, hunger and Apache raids. The tide turned again (for the worse) by the mid-20th century, as Doña Ana became once again a small Hispanic-American farming community, with the church as one of the few reminders of its past. Even the dusty farms and pecan orchards could no longer sustain the small village. Wealthier inhabitants preferred to spend their dollars in neighboring Las Cruces, or even across the state border in El Paso, Tex. The town was dying. Graffiti soon darkened adobe exteriors as shops were boarded up and youth gangs controlled the streets. By the late 1980s, the future of Doña Ana appeared bleak. Our Lady of Purification stood above it all, but her walls were falling. By 1990, drugs and gang violence had settled upon the town like a plague. The young men and women of the town needed work, but more than that they needed something to believe in. The Doña Ana Conservation Committee, together with Cornerstones Community Partnerships in Santa Fe, formed the Doña Ana Cultural Committee, which offered assistance for those preparing for a high school equivalency exam, professional training and an employment program for 40 of the community’s most at-risk youths. Garcia hoped to do more than simply remove these young people from the streets; she also hoped to teach them something about their heritage and connect them to their community. First, they would save the church. Patrick Taylor, a specialist in adobe restoration, managed the project. Some walls were mended, others demolished. The University of Arizona, the New Mexico Community Foundation and other organizations offered money, hands and expertise. Even the celebrated local artist Marcos Fajardo contributed his skills, carving by hand both the now prominent crucifix and the statue of St. Michael. After six arduous years, the restoration was complete. Standing outside the reconstituted church with its robust adobe walls, courtyard and statue of Doña Ana herself, one can see why Garcia wants to continue work with a new generation. Buildings across the street from the church remain in shambles; they too are historical monuments. The county store, first operated by a German Jew among the Spanish and Indians of the 1850s, remains there. A saloon stands nearby, as does the old barracks. Eight buildings in all, with the church at their center, cry out for restoration. Garcia sees potential for a model historic village, offering glimpses of a history returned to light. Taking photographs inside the church, I was amazed at the attention to detail paid by the workers of the restoration project. Their artistry shines through at every turn, the smell of history seeping from concrete, stucco and wood. I think of the blood and sweat that goes into working on such a place, knowing that eight buildings remain. These will require unrelenting hands and persistent wills, every bit as spirited as the pioneers who preceded them. View a slideshow of the restored church. Interesting article. Too bad the slide show vanished from your web site so quickly. At least, I couldn't get it today. Perhaps you don't have room to save these things beyond the latest issue. I was delighted to see this article. I grew up in nearby Las Cruces, N.M. Our historic churches are truly a national treasure. Many have already been lost forever. I encourage others to get involved in their preservation. This article also appeared in print, under the headline "A Church Reborn," in the August 18, 2008 issue. Bryan Lindenberger is a freelance writer living in Doña Ana County, N.M.